There is a lot I have learned from these two chapters. First is the character of Daniel, who refused the kings meat and wine. Can you imagine doing that? Having the audacity to challenge the king? Daniel was brave and because he was brave he earned the trust of the king! We learn that by not taking the kings meat and wine that Daniel and those who participated in eating grains and water were better off. Why is that? God has a commandment on our health, for our own benefit. He knows what our bodies need to survive. This is one of the earlier examples of the Lord telling his people about eating healthy. Besides eating healthy and learning of the brave nature of Daniel, we learn about Nebuchadnezzar’s dream and the interpretation of that dream. Why is this dream important? Because the last kingdom, the one that shall never be destroyed… is now! That kingdom is the Restored Church of Jesus Christ that is on the earth now! Daniel and the fourt other children with him are given “…knowledge and skill in all learning and wisdom: and Daniel had understanding in all visions and dreams.” (Daniel 1:17). These gifts came from God. Nebuchadnezzar has a dream that troubles his spirit, so he calls all the magicians, astrologers and sorcerers to help interpret his dream. When the “wise” men come before Nebuchadnezzar they tell him that they can interpret the dream, if Nebuchadnezzar will explain his dream to them. Well Nebuchadnezzar explains that he can no longer remember the dream and that anyone who is unable to tell of the dream and its interpretation will be destroyed! The wise men all tell Nebuchadnezzar that this task is impossible and only the gods would be able to tell of his dream. This angers Nebuchadnezzar and he commands that all the wise men through the land be killed, this of course would include Daniel and his peers to be killed. Daniel goes to Arioch (the kings captain) and ask for a little of King Nebuchadnezzars time to interpret his dream. 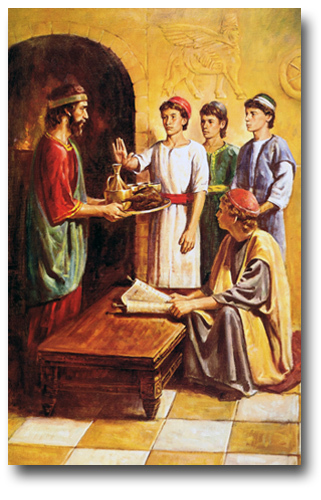 Before going to the king, Daniel stops off at his house and explains to his companions that they need to ask God for help to be saved from death. With their prayers the secret of Nebuchadnezzars dream is revealed to Daniel. Daniel praises the Lord; “…Blessed be the name of God forever and ever: for wisdom and might are his… he changeth the times and the seasons: he removeth kings and sitteth up kings: he giveth wisdom unto the wise, and knowledge to them that know understanding: (Daniel 2:20-21). Nebuchadnezzar is the golden head, and the other parts of the image’s body are subsequent kingdoms (Medo-Persian, Greek and Roman). When the fourth kingdom, represented by the feet, is destroyed all other kingdoms will be destroyed along with it. The iron and clay of the feet indicates that the kingdom is partly strong, and partly weak. The fourth kingdom will be divided into ten smaller kingdoms, each represented by a toe. Daniel explains that the kingdoms reprented as “half iron and half clay” will be kingdoms whoe mingle the seed of men to the point where they don’t mix, like Iron and Clay do not mix. 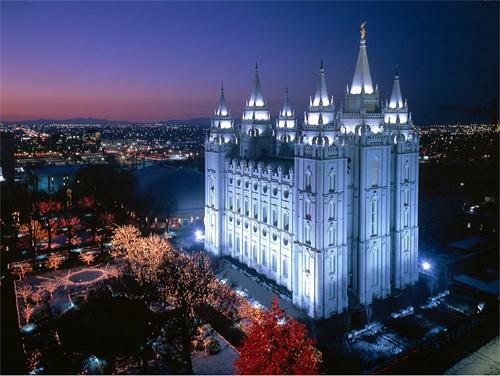 At that time God will set up a kingdom that will never be destroyed (represented by the stone). Upon hearing Daniels interpretation, Nebuchadnezzar fell down and worshiped Daniel and gave him whatsoever he wanted. Daniel is appointed as ruler over all the province of Babylon and sets Shadrach, Meschach and Abed-nego over the affairs of Babylon. This entry was posted in Daniel, Old Testament and tagged Babylon, Daniel, Day, Dream, God, Heath, Hyrum Smith, Interpretation, Joseph, Joseph Smith, Kingdom, Latter, Mormon, Nebuchadnezzar, Saint, Smith, Temple, Wilford Woodruff, Wisdom, Word. Bookmark the permalink.